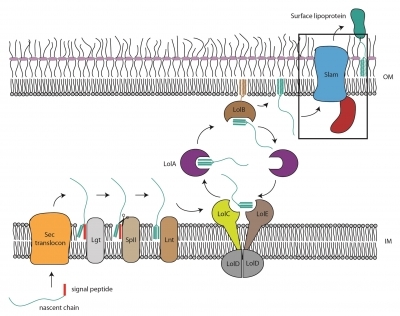 In a paper published online on Feb 29, 2016 in Nature Microbiology, the Moraes lab investigated the transport of surface lipoproteins (SLPs) in Neisseria and discovered a key component of the transport process called SLAM. Bacterial pathogens that cause gonorrhea and meningitis have developed a number of virulence factors to survive inside our body. One of the most well characterized virulence factors is the class of proteins called surface lipoproteins or SLPs. SLPs are used by these Gram negative pathogens to acquire iron and evade the immune system. Given their surface localization and importance in infection, SLPs have been proposed as excellent vaccine antigens against bacterial pathogens. However, the proteins or protein complexes responsible for the proper synthesis and display of SLPs had been an open question in the field. Like other lipoproteins, the Neisserial SLPs use the Sec translocon followed by the Lol system to reach the outer membrane. However, they discovered that movement of these SLPs across the outer membrane required a previously uncharacterized family of protein they named Slam for Surface lipoprotein assembly modulator. Slams interact with SLPs in the outer membrane and are found in a number of Gram-negative bacteria. The Moraes lab also showed that the addition of Slam allowed for the delivery of SLPs to the surface of laboratory strains of E. coli. In the future, the display of SLPs by Slam has applications in development of SLP-based vaccines against bacterial pathogens.